Whether you gather your guests early or party late into the night, your wedding will find its heart around the table, with food and drinks and friends and family coming together to celebrate your true love. Use your chosen meal as the stage, inviting your revelers to leave behind the everyday and step into a fantasy of your own creation. 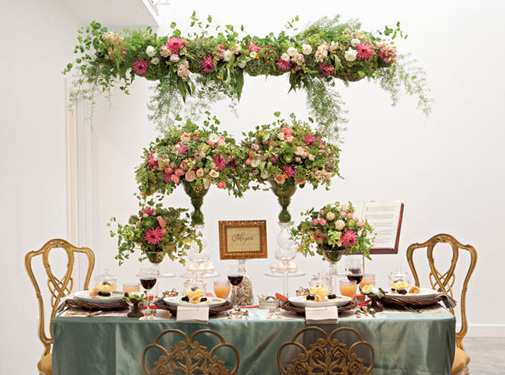 Inspired by cultivated English estate gardens gone a little wild, Hitched Weddings & Events created this floral fantasia with Rosemary Stafford Floral Design, both based in Northwest Portland, envisioning a lyrical wedding brunch with musical accents and a string trio. Imagine the harmony between violin melodies and the sparkling morning light creating a truly uplifting gathering that leaves everyone feeling as light as the music dancing through the air. Large, dramatic arrangements of English garden roses, ranunculus, dahlias, geraniums, snapdragons, mint and kale form a lush backdrop when presented at varying heights—even draped from a vintage ladder hung horizontally over the wedding party table. ? 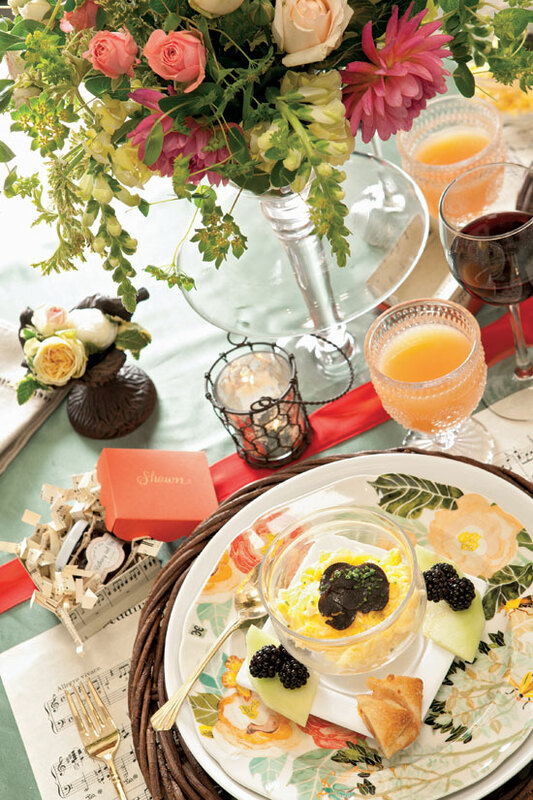 Garden delights infuse the meal as well, with floral print plates and fresh berries accenting the egg soufflé with fresh shaved truffles by Art of Catering. Guests can enjoy mini jars of “Spread the Love” jam, nestled in ribbons of sheet music, or take them home for a memorable taste. ? 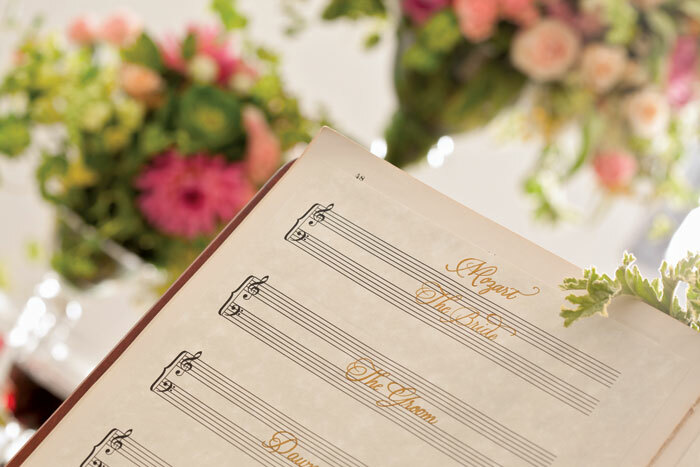 Name tables after classic composers and direct your guests to each blooming wonderland with the seating assignments calligraphed by Northeast Portland-based Alesia Zorn on blank sheet music. Soirée and East West Floral Arts, both in Southeast Portland, harkened back to the Atomic Age to bring this swinging cocktail hour fete to life. Combining delightful touches of nostalgia like gleaming teak furniture, a chrome fondue set and classic cocktails with a punchy palette of turquoise, yellow, brown and orange, they’ve created the setting for an event full of both warmth and swagger. Rich woods, bold graphics that evoke the shape of record albums, and architectural floral arrangements—which play off the popularity of house plants in the 1950s—make tables a welcome rest stop, but classic party snacks like shrimp cocktail and fondue by Southeast Portland’s Simpatica Catering encourage guests to mix and mingle. 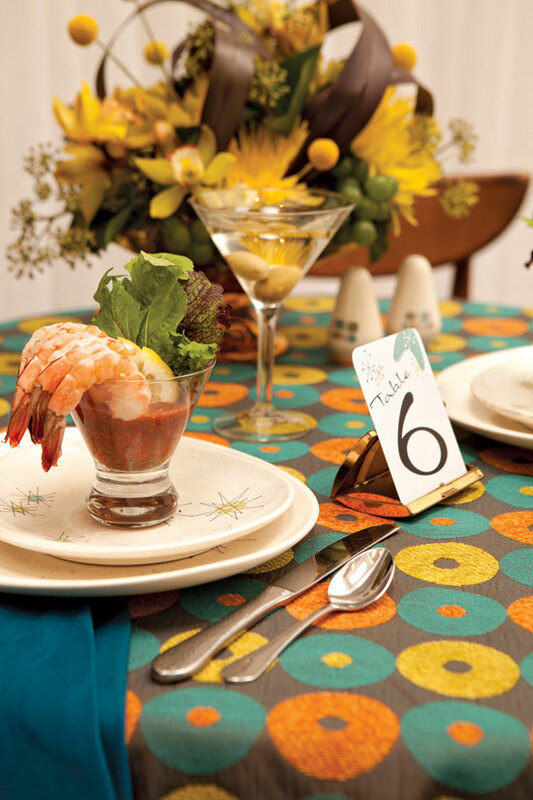 Bonus touch: Vintage cigarette cases holding table numbers or placecards are take-home favors. Shaken or stirred, this party is all about the drinks. Menus by Bella Vida Design, based in Southeast Portland, not only offer a lesson in bartending history, but tie the whole aesthetic together with midcentury fonts inspired by the distinct auto nameplates of the era. Drawing on their own Midwestern childhoods, the creative team at Vibrant Table Catering & Events in Southeast Portland dreamt up an exuberant country celebration with luxe evening polish. “It’s the melding of comfort and style,” says owner and creative director Kurt Beadell. 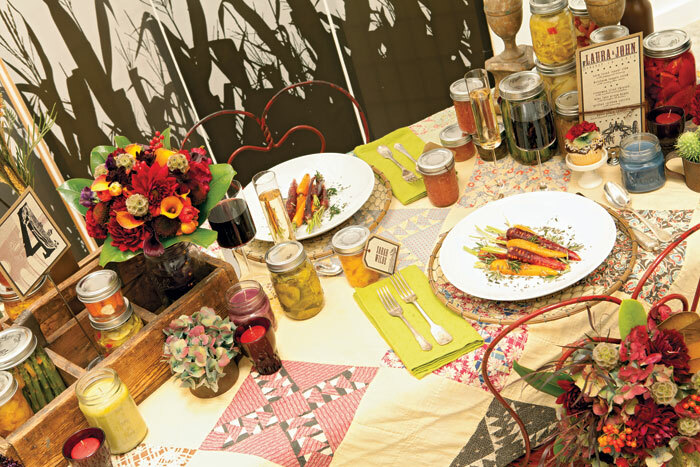 Saturated colors draw from the freshest summer bounty and crisp china and glassware elevate the presentation, while homegrown touches like a quilt-draped table and chicken-wire chargers keep it all down to earth. Like favorite farmers market berries, button mums are heaped into white porcelain baskets, a cheeky table detail that will make everyone smile. 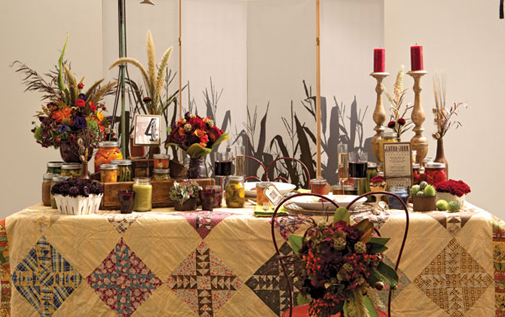 Bring the vistas of the open land to the city with a corn field silhouette printed as a screen backdrop, creating an atmospheric setting in any venue. 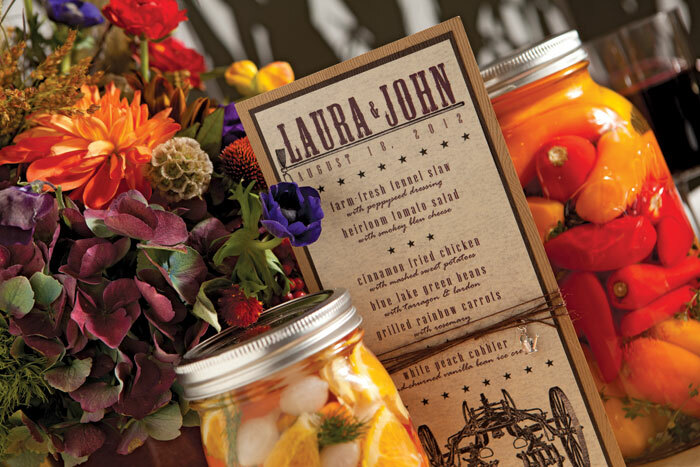 Canned fruits and vegetables aren’t just vibrant table décor—jars of homemade preserves are both seating cards and favors. 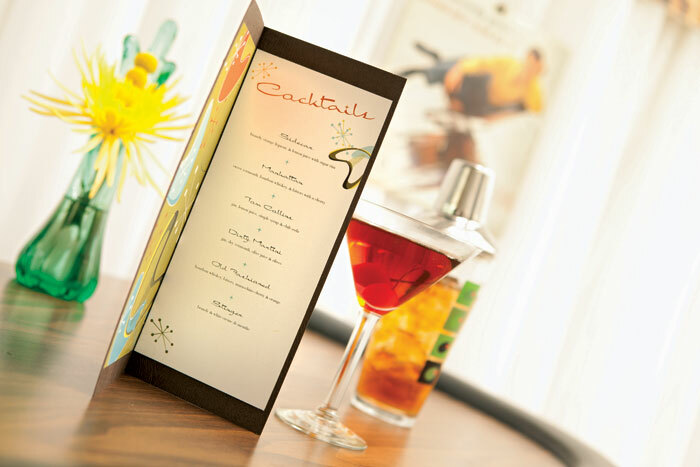 Menus, also by Vibrant Table, reflect the scene with a rustic font, woodgrain paper and a twine wrap.